This semester I've joined a new group on campus called CHAARG. The acronym stands for Changing Health Attitudes and Action to Recreate Girls. It was started last year at the Ohio State University and this school year was started on four more universities including University of Dayton. It's an all girls workout group that is all about owning your fitness, challenging yourself, and being a part of a supportive community. This semester they have a FitPlan 10 week workout plan that sends you a workout a day M-F. I've been pretty good about it, doing at least 4 of the workouts per week. I am also part of a small group that meets Tuesday afternoons (2-a-day Tuesdays!). Overall I'm feeling empowered, healthy, and strong. Today I'm going to share one of my favorite post-workout snacks. 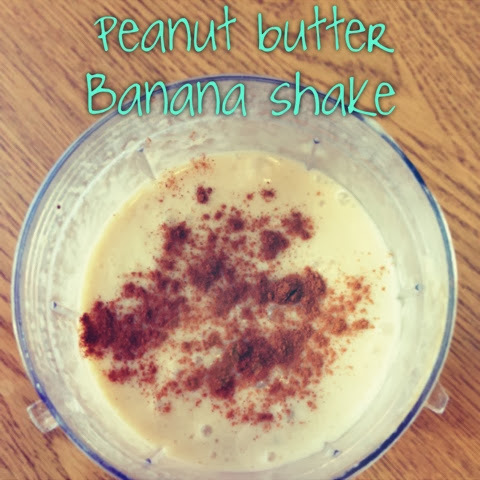 I love peanut butter and banana so I've combined them both into one great shake. 1. Combine peanut butter, banana, ice cubes, and milk in a mixer. Mix until fully blended. 2. Top with a little bit of cinnamon for some flavor. If you want you can also add a scoop of vanilla or chocolate protein powder. When I was going through jaw surgery I was big on added protein, but now I'm working on getting protein naturally. The shake is great for reviving your muscles and quenching hunger after your workout.